Videos for part 4 of the CAL are now on youtube! 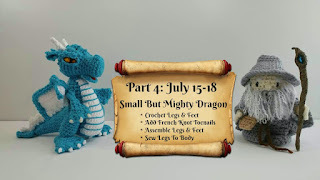 There are 5 videos for this part of the crochet-along (including the introduction video). Please bookmark this playlist for easy finding later. Each time a new part of the pattern is released there will be more videos added. Where can I find the entire pattern for this adorable dragon?